Fair. The responsibility of paying taxes should be shared so that everyone contributes their fair share. Low and middle income Kentuckians shouldn't be asked to pay more of their income to state and local taxes than the wealthiest citizens of the state. Adequate. 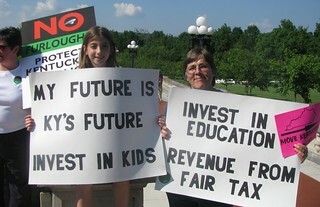 Our taxes are important investments in education, public safety and health – services and structures that we all need. Supportive of promoting the health and well-being of Kentuckians. OUR GOAL: A tax system that is fair, sustainable and raises adequate revenues to ensure that we will make adequate investments to move Kentucky forward. Kentuckians believe in strong communities and in taking care of our neighbors. Public dollars help create communities that reflect our values. Through our tax structure we make sure that we have good schools, reasonable class sizes, quality health care, clean water, and safe and protected neighborhoods. The Kentucky Forward Plan would bring balance to our tax structure, raise between $500 - $800 million in much-needed public dollars, and help bring accountability and transparency to our state government. Kentucky lost $25 million a year when changes were made to the federal estate tax. The Kentucky Forward Plan allows Kentucky to reclaim that revenue from estates worth more than $1 million by decoupling Kentucky’s estate tax from the federal program. This tax excludes farms, and would only apply to those who have more than $1 million in assets, like trust funds and other inheritances. It’s not fair to give the wealthy yet another tax cut and leave everyone else behind. Our income tax rates are from the 1950s. Income taxes would become more progressive under this plan by limiting deductions, decreasing rates for lower and middle incomes, adding a new bracket for the highest incomes, and reducing the generous exclusion on retirement income above $35,000. For the lower-income 60% of us, these changes would, on average, lower our state income tax. Other states tax luxury services like limo rides, armored car services, and private golf club fees. Kentucky does not tax these services. In fact, our surrounding states tax 47 services; Kentucky taxes just 29.We can bring our tax structure up-to-date by closing the exemptions for luxury services. A state EITC for working families earning up to about $47,000 would put about $132 million a year back into the pockets of those working families, and back into our local economies. Kentucky’s business taxes are already competitive (4th among 15 surrounding states). The Kentucky Forward Plan ends special tax breaks that don’t contribute to a better business climate, and ask companies to help make Kentucky a great state to live and work.